Then they told what happened on the road, and how he had been made known to them in the breaking of the bread. Are you looking for a real connection with your fellow parishioners? Ministers of the Eucharist serve the assembly by distributing the Body and Blood of Christ. Sharing of the Eucharist is the heart of the Mass for all baptized Catholics. We are committed to reaffirming our parish community’s faith in the real Presence of Christ in the Eucharist. Eucharistic Ministers are scheduled in advance so you know ahead of time when you are scheduled to serve—generally once or twice a month. Eucharistic Ministers are asked to arrive early for Mass and find their own replacement if they are unable to serve. Learn more about our Eucharistic Ministers here. We proclaim the Word of God to help God’s message take root in our own lives. The Sacred Scriptures cannot have meaning as long as the words remain as letter on a page. They need a voice. Let the voice be yours! Lectors typically proclaim the Word once or twice per month at the Mass of their choosing. Lectors are asked to arrive early for Mass and find their own replacement if they are unable to serve. Learn more about our Lectors Ministry here. Our Marian Visitors bring Holy Communion to those who are sick in hospitals, homebound or in convalescent homes. The faithful who are ill are deprived of their rightful and accustomed place in the Eucharistic community. In bringing communion to them the Minister of Communion represents Christ and manifests faith and charity on behalf of the whole community toward those who cannot be present at the Eucharist. For the sick the reception of communion is not only a privilege but also a sign of support and concern shown by the Christian community for its members who are ill. The Marian Visitors, of St. Helena Catholic Church, including our trainer of communion ministers for those who are sick, are available to those visiting the sick in order that they might share their feelings and experiences. If you are interested in helping in this wonderful and sacred gift to our sisters and brothers in need of Communion, please contact the Parish Office at (707) 963-1228. Sacristan comes from the Latin word, sacer, which means sacred. Sacristans are often behind-the-scene, prayerful volunteers that bring to mind the words of Jesus when He said we should not do good works to gain accolades (Matthew 6:1). The Sacristan is charged with the care of the sacristy especially in preparation of the vessels before and after masses. The Sacristans are crucial to ensuring vessels are prepared for the Liturgy of the Eucharist, therefore, enhancing the quality of our daily community’s liturgical celebrations. At St. Helena Catholic Church, these duties also include cleaning Purificators, corporals and towels along with ensuring other items, such as cruets, corporals, lavabo, and towels are made available for the mass. They also assist in keeping the votive candles filled and holders neat that can be found in front of each of the statues in the church and chapel. The chores of the sacristan should be done in a prayerful manner keeping the sacristy a neat, quiet, and meditative space. The Sacristan Ministry is a vibrant, worthwhile, grace-filled volunteer opportunity which draws us closer to God and our fellow parishioners. May God bless as you consider participating in this ministry at the service of Our Lord and His People. At St. Helena Catholic Parish, we are blessed to have Sacristans that are also our Greeters to welcome people and often triple their service by being ushers as well. 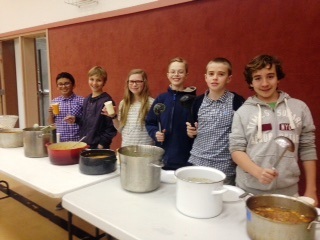 St. Helena Catholic Church altar servers serving homemade soup at Lenten meager meal. Students who have celebrated their First Communion are invited to become altar server. Altar servers are youth who assist the priest in serving Mass. They help to set things up, put things away, carrying the cross, carry the candles, lead processions, ring the altar bells and assist at the Lord’s Table. Altar serving is a wonderful way for a student to learn about the church and to serve God and the church community. Training is provided in the fall of each year. Additional trainings can be arranged if necessary. New servers are required to serve a weekday mass every other week during their first year of training. Altar servers are usually scheduled to serve once a month at the weekend mass of their choice. A schedule is put out every three months and servers unable to fulfill their responsibilities are asked to find a substitute. For more information please contact the office at 707-963-1228. Through song, the Music Ministry helps set the tone for each liturgical celebration. The various choir groups and cantors sing new and familiar hymns, which are relevant to the Scripture readings, to enrich the faith and prayer life of the community. If you love to sing or play an instrument, please consider joining the Music Ministry. For more information on our Music Ministry, please click here. Ushers set up the church for Mass, greet and seat parishioners, assist with the collection, pass out bulletins, and tidy up the church after mass. If you enjoy meeting and greeting people, this might be the ministry for you. Ushers serve at the same mass each weekend and, therefore, get to know who parishioners are and who visitors to our community are. This allows them to function as ministers of hospitality, always ready to offer help and answer questions. No regular meetings are scheduled; training takes place once a year. For more information, please contact the Parish Office at 707-963-1228.